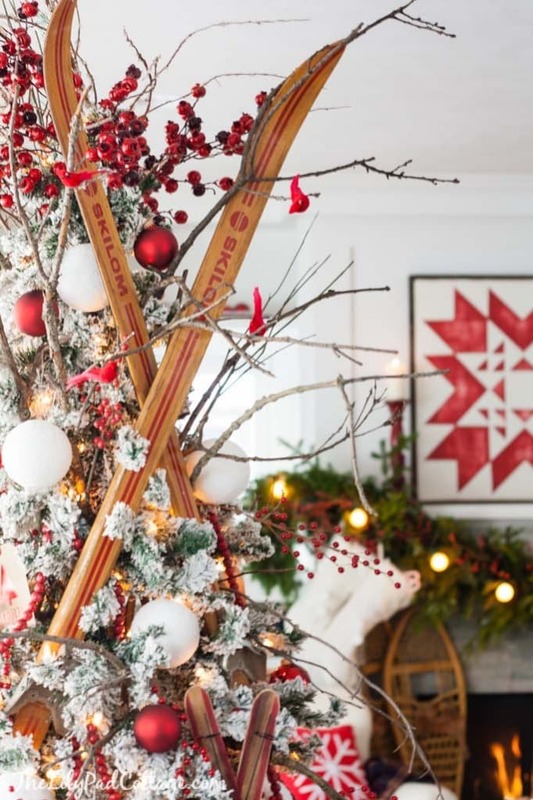 Thank you so much for all the amazing comments on my Christmas tour, I had so much fun with my Scandinavian Ski Lodge theme this year! I wanted to share a few more detail shots and ideas from my tree. My whole theme sort of happened because of this tree. I had hauled all my Christmas stuff up from our crawlspace under the house with my little man, except I realized I forgot the ornaments. 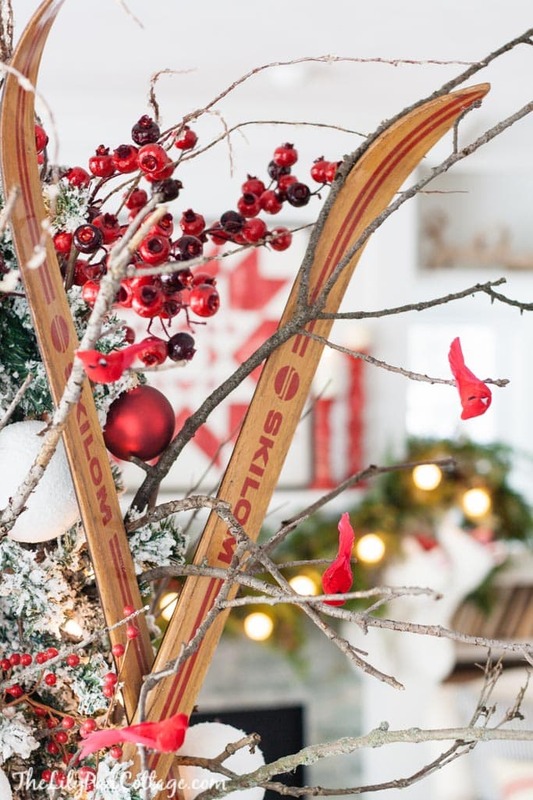 Desperate to start decorating and not ready to face the spider infested crawl space again (or the prospect of nailing my head on the steel floor beam for the third time) I spotted my vintage skis that I had piled in the corner and thought, why not stick those in my tree? It took me more than a few tries to get them in there perfect, but they are just tied in with floral wire. That inspired me to then take little man for a walk in the woods where we gathered a bunch of sticks, you know I’m all about free decor. 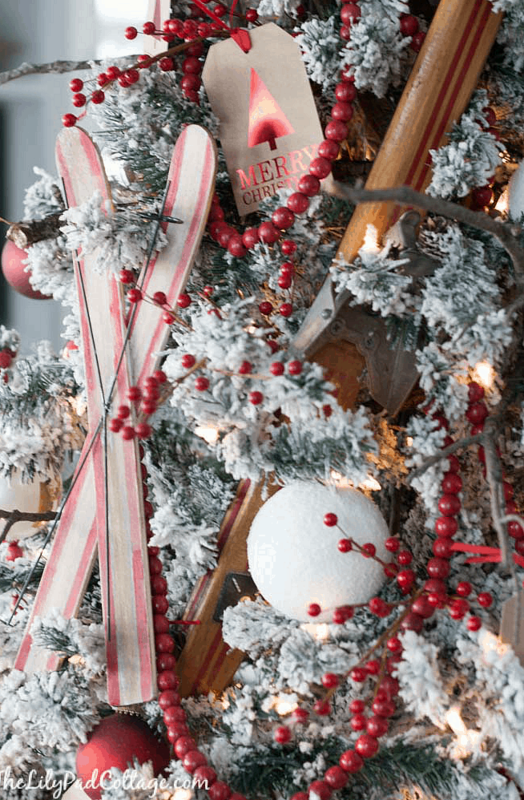 Once I had the sticks and skis, I added these fun snowball ornaments I found at a local store (Flowerland in Grand Rapids for you locals, if you have ever been there, you know they have the most amazing Christmas trees!) 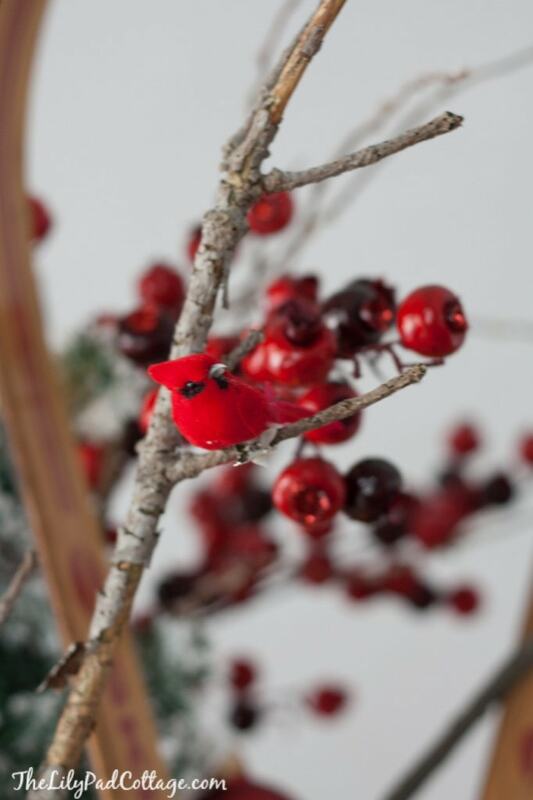 as well as these adorable cardinal ornament clips that I attached to the top branches. Faux berries, wooden beads, and red Christmas ball ornaments added some color. I was at my 2nd home, Target, when I spotted these cute skis in the dollar bin area. I immediately bought every set they had left and I’m glad I did – have you guys seen these all over blogland? I mean they are basically the cutest things, so I wasn’t surprised! I added my own little twist by painting red stripes down the sides for a bit more color. I just placed a piece of painters tape down the middle, painted the edges and tada! I also grabbed these cute gift tags from Target as well. This is a great tip and the 2nd year I have placed gift tags on my tree. They were like $3 for a pack of 12 so you can’t beat that price wise for Christmas ornaments! This has definitely been one of my favorite trees, and my kids thought it was so fun too! Confession, I only decorate 2/3 of my tree and let them have at the one side. So if you come to my house you’ll notice 2/3 of the tree is meticulously decorated and the other side is a beautiful mess of my kids favorite ornaments and Christmas crafts. 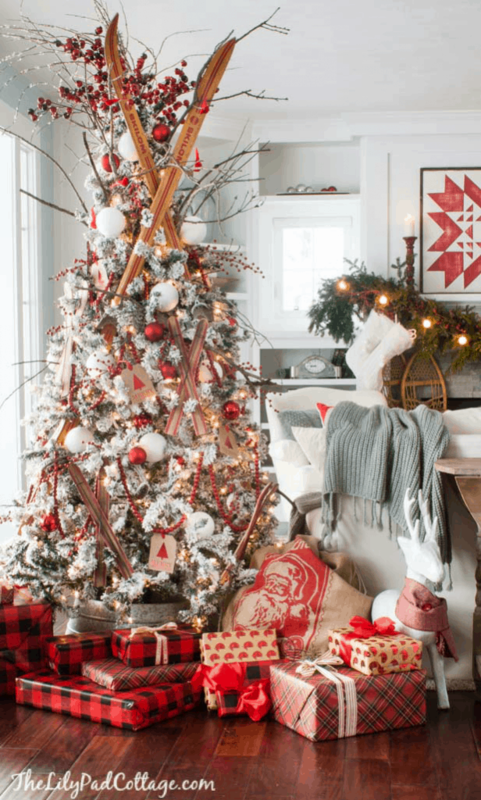 You can take the full Holiday Home Tour here for more inspiration! 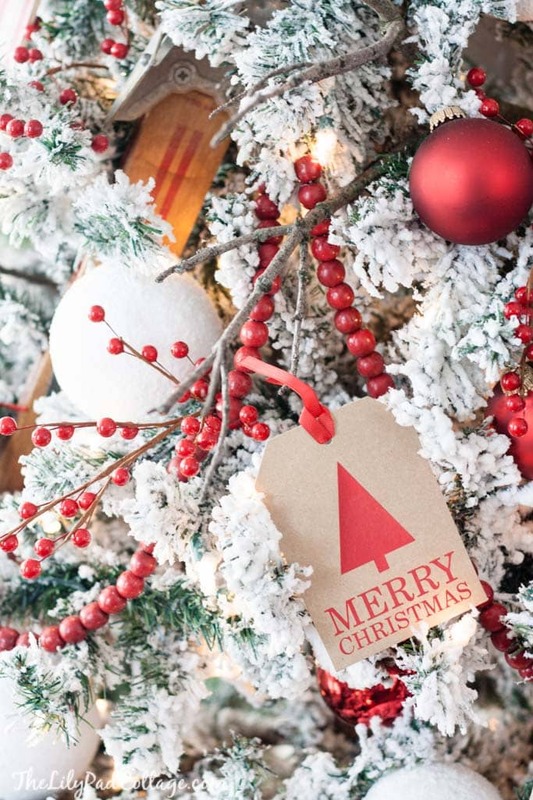 Thanks for sharing the detailed photos of your beautiful tree. 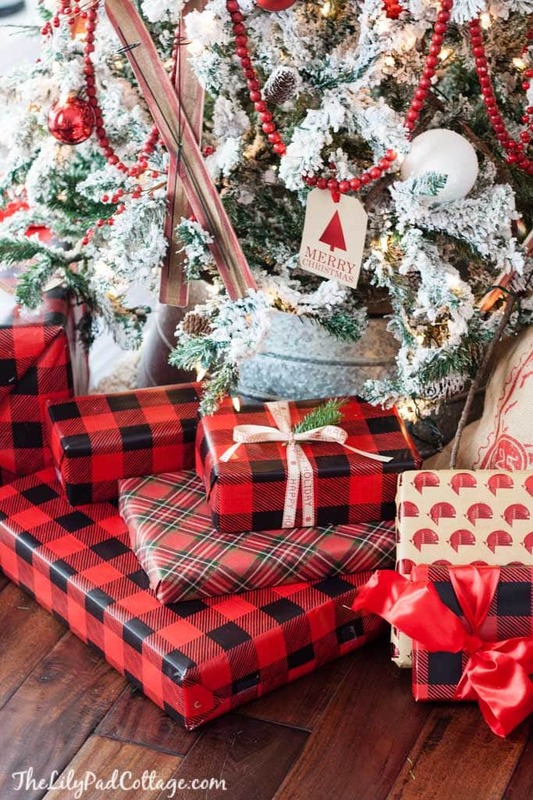 Gift tags — what a great idea! Sadly I don’t think that my Target had those adorable little skis this year. I love them on your tree, though! And what a sweet thing to let your kiddos have part of the tree all to themselves. That’s awesome and they will always remember that! Your tree and decor has been my favorite so far! 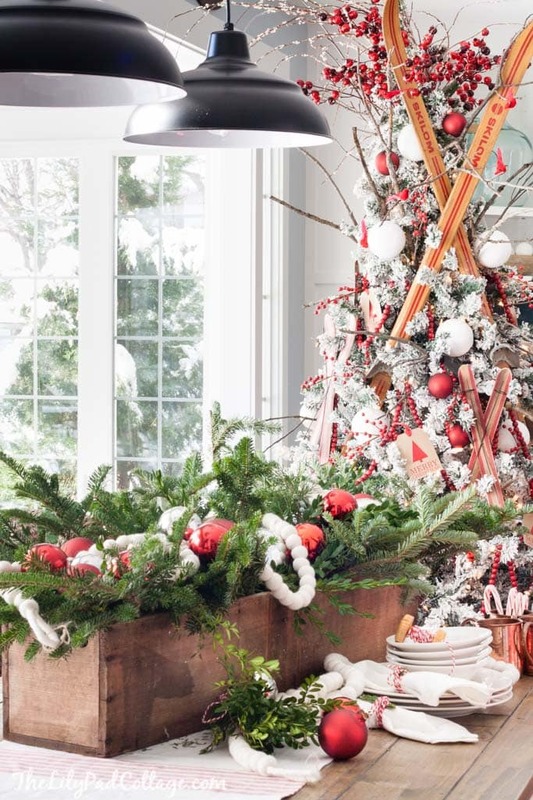 That tree is just over the top and fun. It’s so good that you let your kids do one side themselves. Creating wonderful memories. Absolutely stunning tree, one of my very favorites this year! New follower too! This tree is unique, welcoming and I love it! Those Skis are everywhere! I LOVE what you did with them! Can I ask where you got your flocked tree from? I want to try to do one next year. It is the cutest.. I know what you mean about the crawl. Had one for years never liked going in it. Enjoy your holidays!! 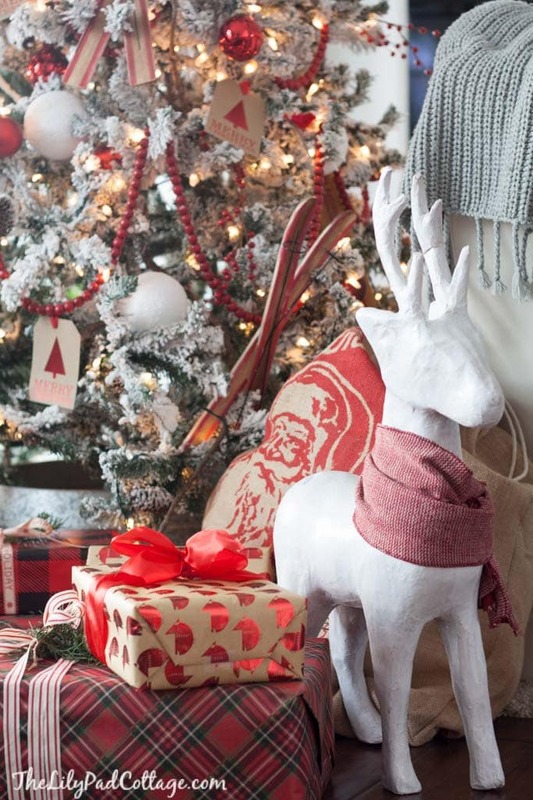 Love the theme of your house this year.